Seven weeks after wrapping up 6 Degrees Den Haag in the Netherlands, our first international venture, I went back to The Hague to have follow-up conversations with our partners and key organizations on the ground. I was particularly interested in sitting down with our main supporter, The Hague’s Deputy Mayor, Rabin Baldewsingh, to understand the kind of impression and impact that 6 Degrees left in his community. This interview has been slightly edited for length. Good morning Deputy Mayor. It’s been almost two months since we produced 6 Degrees Den Haag. How do you feel? What impression has 6 Degrees left on you and your city? What we started was something completely new. I was very enthusiastic because when I came to Toronto last September I was impressed to see a dialogue session in the 6 Degrees format. It was no longer a conference. This was really a dialogue and the setting was unique. And so, I was impressed that it worked in Toronto and was excited to try it in my own city. The second thing was that we have had tremendous challenges with the rise of populism, with a good part of our society moving more towards the right at a time where we had, and continue to have, a large influx of refugees in our European cities. In light of the difficulties, I thought that it would be good to make that connection with Canada and see the kind of solutions we could work on together, and perhaps implement some of those in the city. That said, I was glad and honoured that you agreed to bring 6 Degrees to The Hague. By the way, I thought that the sessions at the Peace Palace were moving. I enjoyed them and I think that the outcome is very interesting. I am stressing on the outcome as far as my future policy on integration is concerned. I learned a lot and have started to apply that learning on my job. Also, another outcome is that many people continued talking about it after you left. Not only people who attended 6 Degrees Den Haag but also people from the academic world and civil society groups in the city. For example, Princess Laurentien had heard about our initiative and she is excited for the possibility to collaborate with us on behalf of her Missing Chapter Foundation, a beautiful foundation that empowers children in our society. 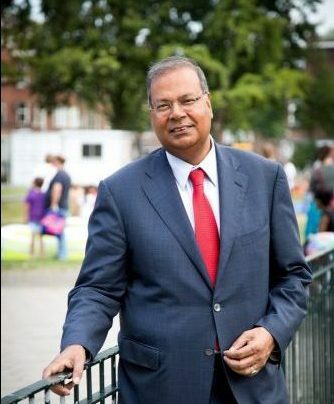 You came to the Netherlands as an immigrant from Suriname and now you are the Deputy Mayor of the “City of Peace and Justice.” You were given an opportunity and through your hard work you are now here. However, you once mentioned to us that you felt much more included in your community when you first immigrated to The Netherlands than you feel at the moment. What has changed? And do you see things improving in the future? Times have indeed changed. There is very fruitful ground in The Netherlands for racism and discrimination. We have all kinds of research that proves this. What you see is that people are reacting very harshly. The society itself has become rude and hard. Tolerance is actually a little bit on the attack, politically but also in our society. I notice this more because I am one of the politicians with a migration background, I speak different, my food is different, my clothing sometimes is different. I am very happy with the way I am but the question is, is everybody happy with that? I’ve experienced that there was more solidarity within society years ago than there is now. Time is changing and I am experiencing that change. So you think that the way you were welcomed into your city before is better than it is now? Or is it just that society has changed and you see it from a different lens? It’s both. I have been living here for a long time now. I speak every day with people in the city and what they say, especially people with a migration background, is that they don’t feel accepted. Yes, we are all here and we are doing our best, but it is time that everyone is accepted. Even though more than half the population in Den Haag comes from a migration background, Dutch people still feel that you as an immigrant have to – on your own – adapt, learn the language, figure out how society functions, etc. That said, in an effort to foster engaged citizenship, we will be launching a civic training program inspired by Canada, where immigrants volunteer in the community and government offices, and that way they learn how The Netherlands works. We are all thrilled about this and hope that we can impact people’s lives. Is there any other way that this relationship between The Hague and Canada, especially in relation to 6 Degrees, has changed the way you govern? It has made us more aware. I am very focused on Canada because I personally believe that Canada provides the best experience of including people from different backgrounds. Canada has for a long time been for me a very good example. Canada has been inspiring for me but what I wanted was a true connection with an organization like yours that works on these issues everyday. Prime Minister Trudeau is implementing progressive inclusion policies (the welcoming of over 30,000 Syrian refugees, for example) because of the work of the ICC and the Canadian civil society. Your work not only helps develop more inclusive societies but also pressures decision makers to act on behalf of the people. In the Netherlands, for example, we don’t have an organization like the ICC nationally. I cannot rely on political parties or the scientific world, and so that it is why it is also a task of municipalities themselves. And so I hope that through this relationship we can start a platform, a network where people from all over Europe join into this discussion. I believe that can be the biggest gift the ICC can give to Europe, to enable us to make a network of people who care about inclusion and citizenship. I’ve also heard that you’ve introduced citizenship ceremonies here. Tell me more about them. Actually, we copied them from Canada. I went to Canada to see how it works. Every Friday we have ceremonies, with the difference that we don’t do it with a presiding official. So what we do is that we bring new citizens together, there are speeches, and there is an oath, like in Canada. The ceremony, but specially the oath, is what we copied. We call it the “Declaration of Being Connected,” a symbolic oath to declare that you’re connected to the Kingdom of the Netherlands. You know, we used to send them the citizenship by mail but we’ve changed that based on Canada. That’s very interesting, and we are happy to be copied when it comes to integrating citizens in a meaningful way. So, finally, what are your plans in the future as you’re expecting an election period in 2018? Municipal elections are coming up on the 21st of March, 2018. There are challenging times in the near future. I told my party that I would like to continue office. Within my party you first have to hold an internal election to become local leader of the PvDA [a Dutch Labour party]. However, there is another candidate and if he wins I think that next year I might stop, but if I win I will continue because I am going to fight the election as a leader of my party locally. On the 15th of June we will know if the internal election within my party is going to be positive or negative for me. It is really exciting times for me, but whether I am here or not I think that we have put up a good legacy. So whether I am in office or not I think that this policy will continue. We have succeeded in putting up a kind of policy that was very successful. We have definitely put up a legacy that will not be compromised.